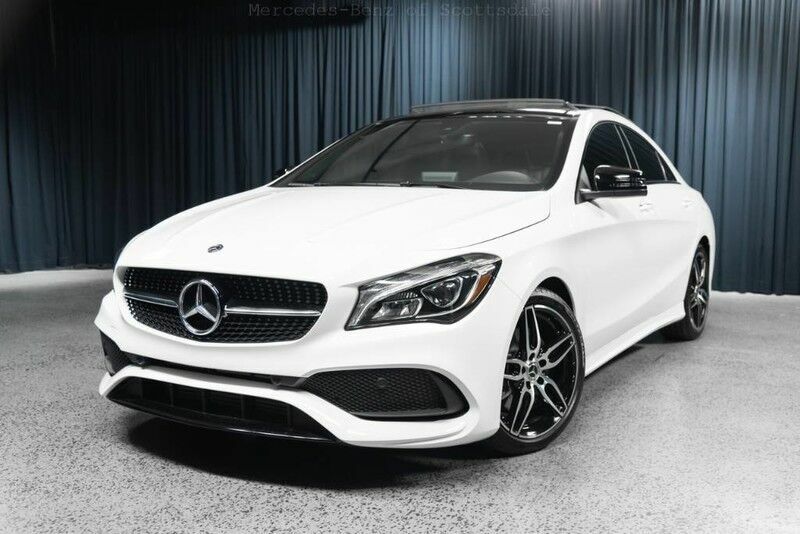 Mercedes-Benz of Scottsdale is excited to offer this 2019 Mercedes-Benz CLA. This Mercedes-Benz includes: SMARTPHONE INTEGRATION Smart Device Integration POLAR WHITE PANORAMA SUNROOF Panoramic Roof Generic Sun/Moonroof Sun/Moonroof Dual Moonroof CONVENIENCE PACKAGE Auto-Dimming Rearview Mirror Universal Garage Door Opener LED HEADLAMPS Daytime Running Lights Headlights-Auto-Leveling BLACK, MB-TEX LEATHERETTE SEAT TRIM Premium Synthetic Seats AMG LINE EXTERIOR Tires - Front Performance Aluminum Wheels Tires - Rear Performance NIGHT PACKAGE Tires - Front Performance Aluminum Wheels Tires - Rear Performance PREMIUM PACKAGE Keyless Start HD Radio Hands-Free Liftgate Heated Front Seat(s) Satellite Radio Power Door Locks Keyless Entry Blind Spot Monitor Remote Trunk Release *Note - For third party subscriptions or services, please contact the dealer for more information. * You could keep looking, but why? You've found the perfect vehicle right here. Beautiful color combination with Polar White exterior over Black interior making this the one to own! The Mercedes-Benz CLA CLA 250 will provide you with everything you have always wanted in a car -- Quality, Reliability, and Character. Contact Mercedes-Benz of Scottsdale today for information on dozens of vehicles like this 2019 Mercedes-Benz CLA CLA 250. Look no further, you have found exactly what you've been looking for. This vehicle won't last long, take it home today. You can finally stop searching... You've found the one you've been looking for. You've found the one you've been looking for. Your dream car.